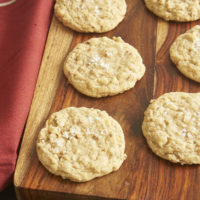 If you love nutty desserts, Salty Mixed Nut Cookies are a must-bake! These sweet and salty cookies feature a soft, chewy vanilla cookie jam-packed with all your favorite nuts. This little blog is about 20% fueled by cookies. One look at the Recipe Index can show you that. Cookies have always been one of my favorite things to bake. I love scooping up perfect portions, placing them in their little spots on a baking pan, and then seeing them all lined up on a cooling rack. Besides this obsessive cookie geometry thing I seem to have, I also am a big fan of a compact dessert packed with lots of flavor. And you can just eat it out of hand. What’s not to love? When my most recent bout of cookie fever struck, I decided to play up an ingredient that’s usually an afterthought in a lot of cookies. Nuts usually exist to add a little flavor and to provide some crunch to your cookies. These cookies, though, are squarely focused on nuts. I used a soft, chewy vanilla cookie base with lots of brown sugar, and then I added a little bit of every kind of nut I could find in my baking stash. I tossed in some cashews, pecans, almonds, macadamias, hazelnuts, and maybe a couple more. Use your favorites, or just focus on one or two. You can decide whether to use salted or unsalted nuts. I generally just use whatever is on hand, so sometimes a batch may be more or less salty than another batch. For a little extra salty bite, you can sprinkle a bit of coarse salt on top of each cookie before you bake them. If you’re a fan of nutty desserts, this Salty Mixed Nut Cookies recipe will be right up your baking alley. So go gather up your stash of various nuts, and get baking! Obsessing over cookie geometry is optional. 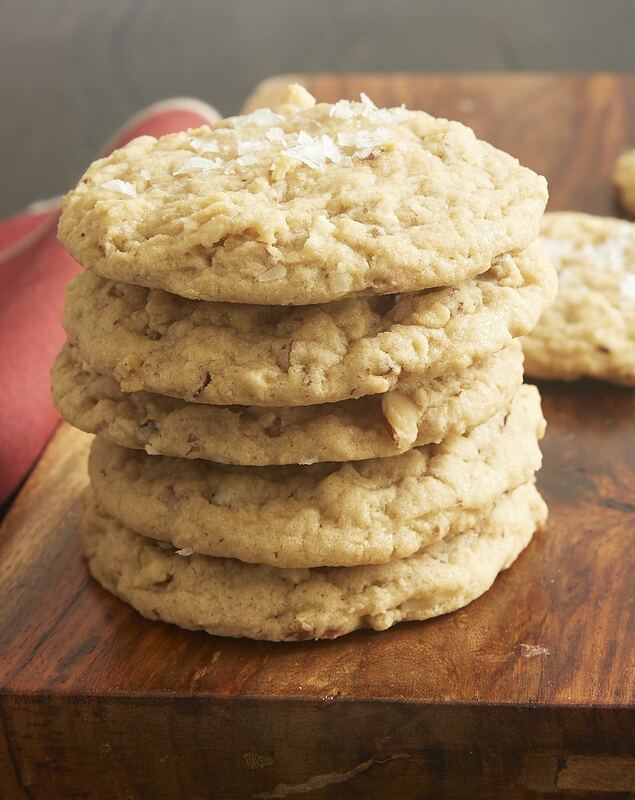 Salty Mixed Nut Cookies are sweet, salty, soft, chewy, and deliciously nutty! Reduce mixer speed to low. Gradually add the flour mixture, mixing just until combined. Stir in the nuts. Drop the dough by 3-tablespoon portions onto the prepared pans. Flatten the top of each cookie slightly. If desired, sprinkle a small amount of coarse salt on the top of each cookie. Bake 12 to 15 minutes, or until the edges are browned and the centers appear set. If you have a warm kitchen, you may want to refrigerate the cookie dough for about 30 minutes before scooping and baking. *The weight of the nuts may vary depending on the type and combination of nuts used.